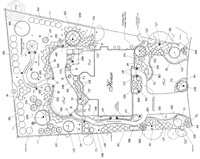 Our in-house Landscape Designer has over 25 years of experience designing landscape concepts for homes and businesses. We’ll start by measuring and plotting your property. While on site, we look at important things such as proper drainage, the condition of the soil, and the amount of sunlight—all of which are crucial for good plant health. We also carefully consider the buildings on site, their architecture, wall color and texture, window heights, foundation heights, decks, and patios. This is a must for making the appropriate plant and tree selections. The designer takes all this information and works collaboratively with you to come up with a master design. This is the only way to arrive at a finished landscape that is unified, has harmony, and is ultimately efficient and healthy.